Rachel Brosnahan plays housewife-turned-stand-up-comic Midge Maisel in Amazon's new series, The Marvelous Mrs. Maisel. 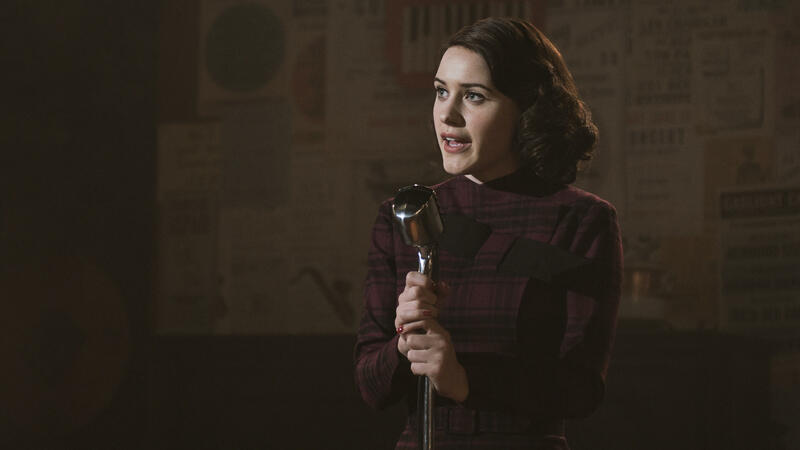 What counts as material, and how you use it, lies at the heart of The Marvelous Mrs. Maisel, the delightfully zippy new Amazon series created by Amy Sherman-Palladino and her husband, Daniel Palladino — a team best known for Gilmore Girls and Bunheads. Set in a brightly colored version of late 1950s New York — the soundtrack is bursting with show tunes and Sinatra — it's a backhanded riposte to the old canard that women can't be funny. When we first meet Miriam Maisel (Rachel Brosnahan) she's in her bridal gown and addressing her wedding banquet. She turns her speech into a piece of impromptu stand-up, complete with jokes about the food not being kosher. But while Miriam clearly has a mouth on her, she's content to be the comfortably Upper West Side wife of Joel Maisel (Michael Zegen) who works in an office by day but, by night, goes down to the Village to try to make it as a comedian. The 26-year-old Miriam, known as "Midge," is just what her parents, her husband and his parents want: a chic, Bryn Mawr-educated, alpha Jewish hausfrau who bribes club owners with brisket to get her husband better performing slots at the Gaslight Café, and who tells total strangers the best way to remove blood stains from a blouse. There's just one problem: Joel proves to be less than she hoped for, as both a husband and a comedian. Midge soon finds herself in that most classic of Sherman-Palladino situations: She's a single woman making it on her own. But how? She uses her clever tongue to become a comedian herself. Before she quite knows what's happened, Midge has crashed the Gaslight Café stage, been discovered by a butch manager named Susie (played by Alex Borstein), been tossed in jail for obscenity and begun an unlikely relationship with, of all people, comedian Lenny Bruce. Although The Marvelous Mrs. Maisel is set in the Mad Men era, it's sunnier and far more yakkety. In fact, there's an aspect of the old Hollywood musical in the dreamy production design and the portraits of Midge and Joel's parents (who are too broadly conceived, yet played by real pros — Marin Hinkle, Tony Shalhoub, Kevin Pollak and Caroline Aaron). They provide the setting for Brosnahan, whose fast-talking brilliance as Midge is a real knockout. Whether Midge is making reflexively neurotic jokes, being devastated by betrayal or slaying people at the club, Brosnahan makes us believe that here is a woman able to shed her conventional life and discover her truest self being funny behind a microphone. This is a not an easy thing to pull off. The trouble with nearly all stories about comedians — from the '80s Tom Hanks-Sally Field film Punchline to the recent show I'm Dying Up Here — is that when they get on stage, they aren't funny enough and their humor isn't as daring as everyone pretends it is. In the monologues written by Sherman-Palladino, Midge does what great comedians are able to do: She transforms personal pain and confusion into a genuinely funny performance. And the series triumph lies in showing us how she turns her life into great and original material. Of course, back then there were no real-life women doing the equivalent of Midge's stand-up act, which pushes far beyond the self-mockery of Phyllis Diller or the wisecracks of the young Joan Rivers. But this isn't a complaint. The Marvelous Mrs. Maisel isn't aiming for realism. It's a heroic fantasy. And Midge's humor, one might say, is the ultimate version of staircase wit. Recklessly honest, she says what female comedians would've said half a century ago — if they had only been free to say it. This is FRESH AIR. Over the last few years, there's been a boom in TV shows about stand-up comedians or people who want to become one. The latest is "The Marvelous Mrs. Maisel," a new Amazon series by Amy Sherman-Palladino and her husband, Daniel Palladino. They're best known for "The Gilmore Girls." It stars Rachel Brosnahan as a young wife and mother in late 1950s New York, who, when her life suddenly changes, finds an outlet in the world of stand-up. Our critic-at-large John Powers says it's not just enjoyable, but it captures today's mood as well. JOHN POWERS, BYLINE: In the new Netflix documentary about Joan Didion, there's an unforgettable scene. Filmmaker Griffin Dunne asks her about the legendary moment when, doing a piece on the counterculture in Haight-Ashbury, she came across a 5-year-old girl tripping on LSD. What was that like, he wonders. Didion pauses and replies, it was gold, which is to say, that the little girl was great material. What counts as material and how you use it lies at the heart of "The Marvelous Mrs. Maisel," the delightfully zippy new Amazon series created by Amy Sherman-Palladino and her husband, Daniel Palladino, a team best known for "The Gilmore Girls" and "Bunheads." Set in a brightly colored version of late-'50s New York, the soundtrack is bursting with show tunes and Sinatra. It's a backhanded riposte to the old canard that women can't be funny. When we first meet Miriam Maisel, played by Rachel Brosnahan, she's in her bridal gown and addressing her wedding banquet. She turns her speech into a piece of impromptu stand-up, complete with jokes about the food not being kosher. But while Miriam clearly has a mouth on her, she's content to be the comfortably Upper-West-Side wife of Joel Maisel - that's Michael Zegen - who works by day but by night goes down to the village to try to make it as a comedian. The 26-year-old Miriam, known as Midge, is just what her parents, her husband and his parents want - a chic, Bryn Mawr-educated, alpha Jewish hausfrau who bribes club owners with brisket to get her husband better performing slots at the Gaslight Cafe and who tells total strangers the best way to remove bloodstains from a blouse. There's just one problem. Joel proves to be less than she hoped for as both a husband and a comedian. Here, Midge hears Bob Newhart on TV doing Joel's act, and she races into the kitchen to tell him. RACHEL BROSNAHAN: (As Miriam "Midge" Maisel) Joel, Joel, you're not going to believe this. Bob Newhart is doing your act. MICHAEL ZEGEN: (As Joel Maisel) What? BROSNAHAN: (As Miriam "Midge" Maisel) Bob Newhart - he's on "Ed Sullivan." He's doing your act. He must've to come to the club one night and seen you perform. And now he's on television doing it just like you do. Well, it's a little bit different because he does it faster, which is better, actually, but that's besides the point. I'm mad. Aren't you mad? ZEGEN: (As Joel Maisel) Midge, relax. BROSNAHAN: (As Miriam "Midge" Maisel) You're not mad. ZEGEN: (As Joel Maisel) No. BROSNAHAN: (As Miriam "Midge" Maisel) Or stunned - not even mildly bemused? ZEGEN: (As Joel Maisel) It's his act. BROSNAHAN: (As Miriam "Midge" Maisel) What? ZEGEN: (As Joel Maisel) Are you going to put the rest of this on a platter? BROSNAHAN: (As Miriam "Midge" Maisel) How is it his act? How do you know his act? ZEGEN: (As Joel Maisel) I've got his record. BROSNAHAN: (As Miriam "Midge" Maisel) So you stole Bob Newhart's act? ZEGEN: (As Joel Maisel) It's fine. Everybody does it. BROSNAHAN: (As Miriam "Midge" Maisel) Everybody steals his act? ZEGEN: (As Joel Maisel) Yes. No - not steals, borrows. It's no big deal. BROSNAHAN: (As Miriam "Midge" Maisel) It's not? When I found out June Friedman (ph) used my meatloaf recipe, I almost stabbed her in the eye with a fork. BROSNAHAN: (As Miriam "Midge" Maisel) Borrows. ZEGEN: (As Joel Maisel) ...Borrows everybody else's jokes, especially at the beginning. Bob Newhart probably used Henny Youngman's stuff when he started. That's how it's done. ZEGEN: (As Joel Maisel) It is. BROSNAHAN: (As Miriam "Midge" Maisel) I thought you'd written it - that act. POWERS: Midge soon finds herself in that most classic of Sherman-Palladino situations. She's a single woman making it on her own. But how? She uses her clever tongue to become a comedian herself. Before she quite knows what's happened, Midge has crashed the Gaslight Cafe stage, been discovered by a butch manager Susie, played by Alex Borstein, been tossed in jail for obscenity and began an unlikely relationship with, of all people, Lenny Bruce. Although "The Marvelous Mrs. Maisel" is set in the "Mad Men" era, it's sunnier and far more yakkety. In fact, there's an aspect of the old Hollywood musical to the dreamy production design and the portraits of Midge and Joel's parents, who are too broadly conceived, yet played by real pros - Marin Hinkle, Tony Shalhoub, Kevin Pollak and Caroline Aaron. They provide the setting for Brosnahan, whose fast-talking brilliance as Midge is a real knockout. Whether Midge is making reflexively neurotic jokes, being devastated by betrayal or slaying people at the club, Brosnahan makes us believe that here is a woman able to shed her conventional life and discover her truest self being funny behind a microphone. This is not an easy thing to pull off. The trouble with nearly all stories about comedians, from the '80s Tom Hanks, Sally Field film "Punchline" to the recent show "I'm Dying Up Here," is that when they get onstage, they aren't funny enough, and their humor isn't as daring as everyone pretends it is. In the monologues written by Sherman-Palladino, Midge does what great comedians are able to do. She transforms personal pain and confusion into a genuinely funny performance. And the series' triumph lies in showing us how she turns her life into great and original material. Of course, back then, there were no real-life women doing the equivalent of Midge's stand-up act, which pushes far beyond the self-mockery of Phyllis Diller or the wisecracks of the young Joan Rivers. But this isn't a complaint. "The Marvelous Mrs. Maisel" isn't aiming for realism. It's a heroic fantasy. And Midge's humor, one might say, is the ultimate version of staircase wit. Recklessly honest, she says what female comedians would've said half a century ago if they had only been free to say it. GROSS: John Powers writes about film and TV for Vogue and Vogue.com. Tomorrow on FRESH AIR, we'll talk with Guillermo del Toro about directing his new film "The Shape Of Water." He also directed "Pan's Labyrinth." And Cullen Murphy will describe growing up the son of a comic strip artist during the golden age of the Sunday newspaper comics. His father drew the popular "Prince Valiant" strip, which Cullen eventually wrote. He has a new memoir. I hope you'll join us. (SOUNDBITE OF ART PEPPER'S "THERE WILL NEVER BE ANOTHER YOU") Transcript provided by NPR, Copyright NPR.